When the king of the Ammonites died, David wanted to show kindness to his son in return for harboring him from Saul. David sent a delegation to express sympathy to Hanun, the king of the Ammonites’ son. However, Hanun took them for spies and shaved off half their beards and cut off their garments and sent them away. This was a great humiliation, so the men stayed at Jericho until their beards could grow back. Because of this, the Ammonites thought they would attack David. They hired soldiers from Beth Rehob, Zobah, and Maacah. David sent Joab to meet them with the entire Israelite army. Despite having battle lines in front and behind them, the Israelites attacked and the enemy fled. However, the enemy (The Arameans) regrouped, attacked again, and were routed again — this time by David himself who chased them and killed a vast number. They made peace with Israel. David realizes with God comes victory. God rejects the people but also restores them. With God, anything is possible. 13) Part personal Question. My answer: The Ammonites mistook David’s sympathy delegation for spies, so they shaved off the men’s beards and cut their clothes and sent them back home. Very similar to David and Abigail (1 Samuel 25) in the sense of a misunderstanding/misinterpretation that can go wrong. We all can read into things and then make decisions based on faulty information, which can lead to hurting others and broken relationships amongst other things more serious when nations are involved. I can misinterpret things said to me and then I respond and then I look like the fool and end up having to apologize. Luckily, in God’s grace, I’m forgiven for jumping to conclusions. 14) Part personal Question. My answer: God. Having trust and faith that God supports you and is guiding you is key when making life decisions. Having patience in God’s timing and knowing He will do it all and having faith in God to do it all is the lesson learned here. “The Lord will do what is good in his sight” is the lesson, and knowing what is good is the result — whether it’s your good or not — is key as well. 15) Personal Question. My answer: With God we gain victory. It’s having the faith to know that in your heart, praying for His guidance, to give His victory and not your victory that is key to happiness and contentment in life. Although misunderstanding in relationships thankfully don’t often result in full-blown battles with bloodshed, we can learn that when we offer an olive branch and it’s rejected to seek clarification first before responding irrationally and doing things or saying things to break relationships that may never recover. Scholars do not know why the Ammonite nobles suspected him. However, it is common for liars to always suspect others of lying. In that culture, many men would rather die than have their beard shaved off. A clean-shaven face was the mark of a slave and free men wore beards. David didn’t use these men as political tools to whip up anger against the Ammonites. He cared more for their own dignity and honor and allowed them to wait before returning to Jerusalem. David was nothing without his mighty men who didn’t necessarily start as mighty men; many were the distressed, indebted, and discontent people who followed David at Adullam Cave (1 Samuel 22:1-2). Who were David’s mighty men? Adino the Eznite – famous for killing 800 men at one time (2 Samuel 23:8). Jashobeam who killed 300 men at one time (1 Chronicles 11:11). The Israelites found themselves surrounded. In front of them were the Ammonites and behind them were the Syrians. It looked bad for the army of Israel. What did Joab do right? Attack. Joab had only one strategy in battle – attack. Many generals would have surrendered when surrounded on both sides by the enemy, but not Joab. He called the army to courage and faith and told them to press on. Courage and strength are not matters of feeling and circumstance. They are matters of choice, especially when God makes His strength available to us. We can be strong in the Lord and in the power of His might (Ephesians 6:10). Remember what and who they are fighting for. Joab called them to remember all they had to lose. If they lost this battle, they would lose both their people and their cities. Remember God is in charge. Joab wisely prepared for the battle to the best of his ability and worked hard for the victory. At the same time, he knew that the outcome was ultimately in God’s hands. God promised this kind of blessing upon an obedient Israel (Deuteronomy 28:7). The offending Ammonites were still in their city and Joab returned to Jerusalem. In the spring King David sent Joab and the army out again to deal with Rabbah as he waited in Jerusalem. While he waited comfortably in Jerusalem, he fell into sin with Bathsheba. 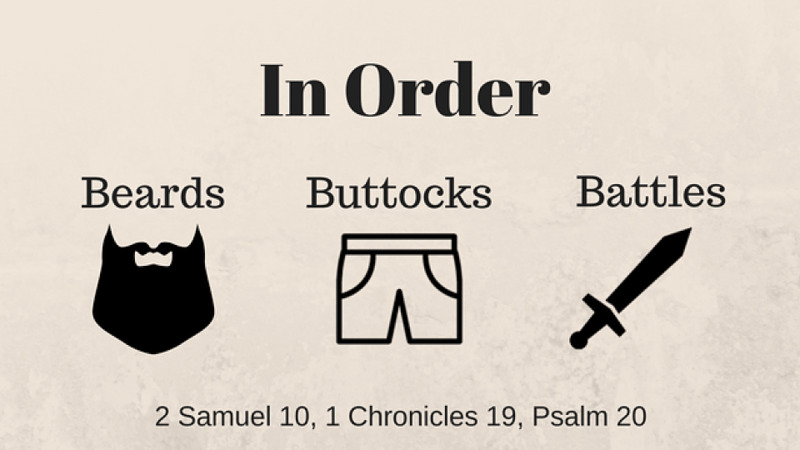 2 Samuel 10 shows that God gave David a warning by showing it necessary for him to come out against the Syrians. David tried to leave the battle with Joab in 2 Samuel 10, but his army needed him, and God tried to show him that by blessing him in battle. This is a Michtam, a golden Psalm of David, intended for teaching, to instruct his present and future generations, especially about relying upon God and nothing else in conflict. David knew that when the Lord fought for Israel, victory was assured; if there was defeat, it was because of God’s displeasure. Worse than defeat was the sense of separation from God. What God does in judgment or discipline He can restore in love and mercy. What does the banner signify? The banner signified Israel’s reliance upon God and His victory for them. The truth about God – who He is and what He has done – demanded that this banner be displayed. God proclaimed how the land of Israel was His special possession. The specific mentions of Shechem, the Valley of Succoth, of Gilead, of Manasseh, of Ephraim, and of Judah shows that God did not speak symbolically, but geographically. God said He would exalt Himself over the surrounding nations. Both Moab and Edom were noted for their pride (Isaiah 16:6, Obadiah 3). Here God gives them places of humble service. “When David speaks of ‘the fortified city’ he can only mean Petra, the most inaccessible and impregnable mountain stronghold of Edom. Only God could give victory over such a fortress, and David knew it. 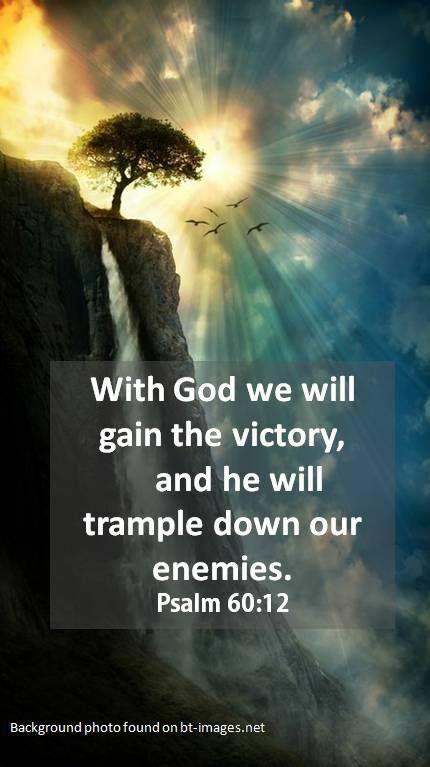 This Psalm begins in defeat, but ends in victory. Summary of passage: God’s plan is to harden the hearts of the Jews until the full number of Gentiles has come in and then all of Israel will be saved. Israel has become disobedient so that God may show them mercy like He has done the Gentiles. 11) All of Israel could mean that literally: all people of ethnic, Jewish descent or it could mean all of Israel that God has chosen to be saved by faith in Jesus (the elect). I think all of the elect because we know faith is a choice. Man must choose God. And not all will choose Him (even His chosen people). 12) They will be saved. We can be sure because God says so through Isaiah. God will once again turn His attention to the Jews. 13) Part personal Question. My answer: God has reasons behind all His actions. He loves all His people and wants as many as will turn to Him to come. God works through all for His purposes. I am comforted because I know God’s ways are not mine and everything has a purpose for Him. 14) He showed mercy by allowing them to be disobedient and then forgiving them and offering them salvation. We all need mercy because we are all sinners and deserve death. Instead, God offers us eternal life through His Son, Jesus Christ. Without mercy, heaven would be empty. Conclusions: This is the first time I have read all of Israel will be saved at the End Times and I was hoping to dive into this truth more. I love gaining insight into God and His ways and seeing how He won’t leave any behind is awesome! God never gives up on you, on me, on the people of Israel, on anyone. Just imagine what a world this would be if all of us embraced that truth! End Notes: The mystery religions of Paul’s day used the Greek word (mysterion) in the sense of something that was to be revealed only to the initiated. Paul uses this word to refer to something formerly hidden or obscure but now revealed by God for all to know and understand. This word is used of the incarnation, the death of Christ, God’s purpose to sum up all things in Christ and especially to include both Jews and Gentiles in the NT church, the change that will take place at the resurrection and the plan of God by which both Jew and Gentile will be included in his kingdom. Paul continues from Romans 11:11-24 by saying Israel is blind for the sake of the elect Gentiles. God’s attention is temporarily off the Jews until He is finished with the Gentiles. However, He will come back to His people. The hardening is partial and temporary. “All of Israel” does not mean every last person of Jewish descent. It means Israel as a nation. And they will be saved the same way the Gentiles are saved: by faith in Jesus. There is no special or other way for the Jews. Salvation is not universal. All must choose God. Jesus will not return again until God turns the focus of His saving mercies on Israel again, and Israel responds to God through Jesus Christ (Matthew 23:39, Zechariah 12:10-11). Isaiah confirms this truth. The Jewish people will always be loved by God for the sake of the patriarchs. God has not given up on them (or us) as His calling endures. Paul reminds all of us we are lawbreakers and all of us have received mercy from God. None of us are better than another. Summary of passage: Jesus says he’ll give the disciples peace. He tells them to not be afraid or troubled. He is going away and if the disciples loved him, they would be glad for he is fulfilling the Father’s wishes. 12) The Bible tells us that Satan is a fallen angel, a real being who tempts us and tries to destroy us. We see this in the temptation of Jesus. We are told he rules the world until Jesus comes again, hence a prince. He was hurled to earth and tries to lead us all astray. 13) Personal Question. My answer: Jesus gives those who believe in him peace. Currently, I’m struggling with what God wants me to do in my life. Either quit my job and be a full-time mom or stay working and do everything else He calls me in this world. I know whatever I decide, it will be in His will and with His guidance. That gives me peace. Conclusions: If only we could grasp the peace Jesus offers every moment of our lives. I know I struggle with peace and it only comes when I stay close to God and don’t stray or push him aside. Staying in the Word like a bible study helps me to maintain that closeness we all so desperately need. End Notes: Jesus saying Peace be with you was and is a common Jewish departure saying and a common greeting as well. However, Jesus is clarifying this customary saying to say my peace, or Jesus’ peace is the peace of God, an untroubled heart. Hence, along with the Holy Spirit, Jesus is blessing his disciples with peace. Jesus repeats 14:1. With faith, the Holy Spirit, and peace, you will be untroubled. The disciples were troubled at the news of Jesus’ departure. Jesus says rejoice instead! His work through the Holy Spirit will be greater than His work during the years of His earthly ministry. For the sake of the world and yourselves, rejoice! We sense that Jesus is joyful in his soon reunion with God. The Father is greater than Jesus in position but not in being. Both are equally God. At this very moment, Jesus is arranging Jesus’ arrest–Satan is coming. Jesus goes to the cross willingly. Satan has no hold on him since he is sinless. Now Jesus and his disciples are ending dinner and going to go the Garden at Gethesemane. They are still in the room because Jesus doesn’t actually leave until John 18:1. We can imagine Chapters 15-17 is Jesus speaking as the disciples gather round him in the room. As one probably knows when there is a gathering of a big group of people it takes a bit to get them moving. Summary of passage: John sees Jesus on a white cloud with a golden crown and a sharp sickle. An angel tells Jesus to reap the harvest of the earth with his sickle and he does. An angel emerges from the altar in heaven and tells another angel who emerges from the temple to gather grapes with his sickle. The angel did and threw the grapes into the winepress of God’s wrath where they were trampled and blood flowed. 11) Jesus and he was called to reap the harvest of the earth. 13) Personal Question. My answer: God is serious. He will punish those who sin and refuse to accept His grace. He will reap those who follow Him in the harvest. Conclusions: Good dissection of passage. End Notes: Revelation 15 & 16 has the 7 bowls judgment and some scholars see this scene as the preparation of the faithful before the judgments to come. Here, Jesus is going to separate good and evil and gather in the faithful like in a harvest and then assemble all for judgment (Joel 3:12-14; Matthew 3:12; 13:30). This is seen as well in the parable of the wheat and the tares (Matthew 13:24-30; 13:36-43). Christ in clouds: Revelation 1:7,13 and in Daniel 7:13 and Matthew 24:30. Here, Jesus has on his head the crown of victory. Quite the contrast with the crown of thorns. The Greek word for “ripe” has the sense of withered. Thus, the indication is God is waiting for sin to be overripe. He is in no hurry. Some translations have verse 18 as “fully ripe”, meaning when the grapes are bursting and ready for harvest. A winepress was a rock-hewn trough about 8 feet square with a channel leading to ta lower and smaller trough. Grapes were thrown into the upper vat and trampled with bare feet. The juice collected in the lower vat. This is a common Old Testament analogy for the execution of divine wrath (Isaiah 63:3; Lamentations 1:15; Joel 3:13). When trampled, the grapes burst and their juice squirts out–like the blood described in verse 20. A horse’s bridle is a few feet high and 1,600 stadia is about 184 miles. Can you imagine how much blood would have to be shed and how many people would have to die to create a flow of blood that would pour out for 184 miles a few feet high? This is the carnage in the battle of Armageddon described in Revelation 16:16 and 19:11-19 and a graphic symbol to the world. Turn to Christ now or face judgment. However, some scholars say this is just a splattering of blood and not an actual blood flow. You make the call. 184 miles is a huge distance for a battle–almost unseen in Ancient Times. But not in modern times. Revelation Chapters 15-19 will reveal the fulfillment of these prophetic declarations of the angels. Conclusions to Lesson 19: In Revelation 13 we see the power of the beast. In Revelation 14 we see who’s really in charge and who will win in the end. Make sure you are part of the 144,000. Be holy and pure and do not worship false idols. Summary of passage: God heard Miriam and Aaron grumble against Moses so He called them together for a meeting. The God descended in a cloud and asked Miriam and Aaron to step forward. God told them that Moses is more than a prophet, one whom He speaks face-to-face with. He asks them why they were not afraid to speak against Moses? Then God leaves in anger. God struck Miriam with leprosy. Both Aaron and Moses cry out to God to heal her. God banishes her from camp for seven days. They Israelites finally move on and camp in the Desert of Paran. 10a) He called Moses, Aaron, and Miriam together to the Tent of Meeting. There he came down in a pillar of cloud and summoned Aaron and Miriam forward. He chastised them, saying Moses is more than a prophet; he is someone I speak clearly with face-to-face. Then his anger burned against them and He struck Miriam with leprosy. Both Aaron and Moses pleaded on her behalf and she was banished for seven days outside the camp instead. b) Personal Question. My answer: His words. How God called Moses a servant of His and is faithful and one whom He speaks with face-to-face clearly. 11a) That Moses is a God’s servant whom He speaks face-to-face with clearly. He sees the form of God and He reveals Himself to Moses in dreams and speaks to him. b) Faithful in everything. I picture God’s house as the world and those saved who dwell in it. Moses is faithful to God’s people and in whatever God asks of him. Moses is faithful to God in the little things and in the big things. Faithful everywhere–in all aspects of life. 12a) God’s anger burned against her and He struck her with leprosy, later commuted to a seven-day ostracism. b) Leviticus 13: Ostracize her and isolate her from the camp and label her unclean. Miriam would have to wear torn clothes, let her hair be unkempt, over the lower part of her face and cry out “Unclean! Unclean!” for as long as the disease remains (probably the rest of her life). She would have to live outside of camp. Cleanse himself as well with sacrifices for touching an unclean person. Her life would have been ruined if not for God’s grace! c) Moses forgave Miriam for her sins and asked God to do so as well. d) Personal Question. My answer: That God is a merciful God. God can administer penalty for sin harshly or not-so-harshly. God could have ruined Miriam’s life by giving her a skin disease that would have taken her from her people. But God relented but still made sure everyone knew she had sinned against Him. God is good. Conclusions: I liked Numbers 12. Great lesson for us to curb our jealous nature. Great lessons on God’s powerful, merciful nature. Great example of God’s love for us. Great example of how we are to answer our accusers: with nothing, preferring God to handle them for us. As we study more and more about Aaron, I get a weaker and weaker view of him. If he hadn’t have been Moses’ brother, I don’t think he would have been chosen to be the High Priest of Israel. Again, God’s infinite mercy and wisdom to choose Aaron. Through him we see our own weaknesses and hopefully learn the lessons God was trying to teach Aaron ourselves. End Notes: God specifically answers Miriam’s question and answers why Moses is so special: God’s relationship with Moses. It is intimate and personal and direct. Miriam’s affliction reflects her heart and in the degree. She receives a very severe case of leprosy. Aaron notices first. Aaron seems to be a follower here again. He is swayed by the Israelites to make a golden calf. He is swayed by his sister to speak against Moses. He’s a very weak leader. Note as soon as he notices his sister, he pleads to Moses to not hold against them their foolish sins. He asks for forgiveness first, then to cure his sister. He is self-interested the entire time. Moses speaks now for the first time and for others. He allowed God to handle his accusers. Here we see Moses “faithful in all my house” as he speaks for his slanderers. God did heal Miriam or she would have never been allowed back inside the camp. Still, it was important for all of Israel to know she spoke against their leader. God is gracious and merciful. Summary of passage: Peter asks how many times should you forgive someone who has sinned against you. Jesus says 77 times. Then he tells the parable of a servant who owed his master millions of dollars. He begged for mercy and the master let him go and canceled the debt. But when that servant was owed a few dollars by another man, he had the other man he choked him and had him thrown in jail over it! When the master found out, he had the servant called in and told him he should have had mercy on the man just like he had and he had him tortured because of it. Jesus says God will do the same thing if we do not forgive others. 12a) Peter thinks there is a limit on the number of times you can forgive someone before not forgiving them and possibly throwing them in jail or what-have-you. Asking about his brother shows he doesn’t get the parallel between God’s forgiveness of us and our forgiveness of others. b) The world follows Lamech’s view: that if he is wronged 7 times he will have his revenge 77 times. The world does not forgive; it only seeks vengeance. Jesus said to forgive unlimited times. Lamech said to seek vengeance unlimited times. 13a) It is like a king who wanted to settle accounts with his servants who owed him so much money that they would never be able to repay it and therefore had to be forgiven or face eternal hell. b) Personal Question. My answer: We must forgive others since God has forgiven us the immensity of our sins for our sins are 77 times greater (or infinitely times greater) than any other sin committed against us by others. We forgive over and over again as God does us. c) Personal Question. My answer: It would be a calmer place to live. Less stressful. More encouraging. Happier. If we truly understood the enormity of our sins then nothing others did to us would matter. Strife would end. Conclusions: I liked this lesson. Very powerful parody in the undeservedness of God’s forgiveness and how we are to extend the same to others. Always easy to say and not so easy to apply in life, thus making it a good lesson to hear over and over again. End Notes: If you were a first century Jew, you were taught you could only forgive someone up to 3 times and that’s it. Here, Peter doubles that, thinking himself generous, which of course, Jesus says is ridiculous. This is Peter, after all. Note the anger of the man who had basically just been set free by his master. He grabbed the guy by the throat very threateningly and demanded payment. How many times have we done the same thing: our anger so overpowering us that we blow something up that was so very minor in our lives? The man was blind to his own sin (as we so often are and why we need people to point it out like Lesson 4 just pointed out) and instead of mercy now received justice. Note we deserve justice but God gives us mercy anyways if we ask His forgiveness and repent. Since God who forgives (when He doesn’t need to since He has nothing to be forgiven of) us who are full of sin, we must forgive others who need forgiveness every day of our lives. We have no right to hold onto grievances. You can forgive sins but the sinner still faces consequences like in the case of murder. Forgive others or you yourself will be tortured. Summary of passage: Abraham took another wife named Keturah and had more kids. He left everything he owned to Isaac but gave gifts to his other sons and sent them away to the land of the east. Abraham lived 175 years and was buried with Sarah in the cave he bought from the Hittites. God blessed Isaac who settled near Beer Lahai Roi. Ishmael had 12 sons who became 12 tribal rulers. He lived to be 137 years old. His descendants settled near Egypt from Havilah to Shur as you go towards Asshur. They lived in hostility towards their brothers. 12a) Isaac got everything. Ishmael got gifts before he died. The sons of Ishmael all settled in Arabia as did most of the sons of Keturah. 13a) Personal Question. My answer: Provided my husband with a job opportunity. He’s given me a band to play in to keep my mind busy. We are lacking for nothing for we have savings. I keep getting the message that I need to write so I keep at it. b) Personal Question. My answer: Husband. Kids. Dog. Conclusions: I spent a little bit of time trying to find where the descendants settled but everywhere I looked it was all speculation as to the exact location so in the end I just linked to where Isaac settled since we’re going to be seeing a lot of him coming up and left the rest to Arabia. I think every day is special as a gift from God and everything He provides is special. So food, clothing, shelter, and another day to live and breathe are special gifts from God. Does Beer Lahai Roi sound familiar? It should. It’s the place where Hagar encountered God in the form of “the angel of the Lord” as she was fleeing from Sarai and Abram in Genesis 16:14. The name means “well of the Living One who sees me.” Interesting that Isaac now ends up there. Fun Fact: Abraham is mentioned 70 times in the New Testament. Only Moses is mentioned more.